I celebrated my 34th birthday with Ethan this year though he is still well keep in my womb right now. I hope he enjoyed every celebration that Mummy had; be it with my Hubby B, my PIL, my friends & also my family. The 1st celebration started of with Hubby B! We had it at Kokiya Japanese Restaurant. He has given me a sweet Naraya handbag. I love it very much. Thanks BB. Then on 27th July, I received a sms from Dad early in the morning. Hmm.... Dad mistaken that it was my birthday. Haha... He gave me an ang pao which I was quite reluctant to receive it initially. However, he said that it is a blessing for me and Ethan. Thanks Pa. 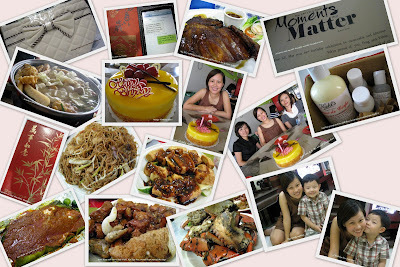 This is the 1st year I celebrated my birthday with my PIL & SIL officially! PIL spent me a scrumptious dinner at Wok & Pan Restaurant. I ordered the BBQ Pork Ribs & the portion was huge. Of course, I couldn't finished it though I'm eating for 2. Thanks PaPa & MaMa. On the D-day, something caught my attention when I opened my room door. Hey.. it is a nicely made birthday card with a box of Kiehl's products from my SIL. I have yet to try it because there are so precious and expensive. Thanks Cheng Leng. This year I just wished to have a small celebration with my friends. So, Liza, Sam & my brother has organized a steamboat lunch for me. Gladys didn't join us because she was having training in KL. But we met up on the next day with Kelvin for a McD lunch. Oh ya, back to our steamboat lunch. We had it at "Tong Sheng Yuan" at Melaka Raya. He was a chef from Restaurant Fat Lee & there are many artists who had visited the restaurant before. However, the steamboat was on the average side. They also bought me a Mango Cake. The Cake is yummy and it was not very sweet. Thanks my friends! SIL or I should said Straits Pharmacy spent me a delicious dinner too. We packed few dishes from Golden Mansion Restaurant. The food served this round was not up to our expectation. Could it be cooked by another chef? The baked crabs was a bit over cooked as the meat was not very juicy. However, I enjoyed the dinner very much with my family. Kai Jun was the most happy one because he always like to see everyone in the family gather together. He even asked me to stay longer to play with him. Haha... Naughty boy! Oh ya, Mummy gave me another ang pao too. The wishes were the same as Dad that I'll have a safe delivery & a healthy baby. Thanks Mi! I always enjoyed my birthday a lot. This is the day that I'll pamper myself. I can't imagine will I still be able to enjoy this day next year when Ethan is around? I bet I will! Thanks everyone! Happy Belated Birthday LiLi. I guess your birthday next year will be full of excitement with baby Ethan!